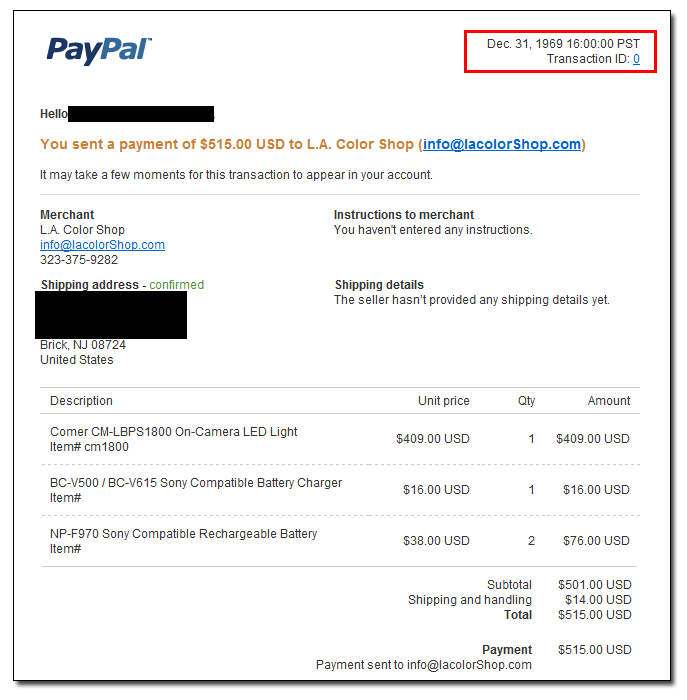 If you placed an order with us but the Paypal email receipt is showing a Transaction date Dec 31, 1969 and Transaction ID 0, please contact us right away. It has been an on going issue since July 2009. Paypal has been having trouble handling some transactions. Our customers added items to cart and proceeded to check out. After that, they will receive an email from Paypal with the receipt showing the Transaction date of Dec 31, 1969 and Transaction ID 0. The transaction actually doesn't occur. No money were taken out from the customer's account. We also do not receive any notice. We have contacted Paypal to try to address the issue. However, Paypal has been very slow in the process. There're other people also report the same issue. The first incident was reported in June 3rd 2009. Even after 3 months, Paypal failed to fix the issue. You can read about this in the Paypal development forum. So please check your order receipt email from Paypal after you placed an order. If you see the transaction date is Dec 31, 1969, please forward the receipt to us at info@lacolorPros.com. We will take care of the order for you.